IMTEC Imaging's ILUMA scanner provides medical and dental professionals the ability to take high-resolution CT scans in the office at a considerable cost and time savings to the patient. The ILUMA scanner is intelligently designed for aesthetic beauty, ease of use, ultra high-resolution scans and the safety of the patient. The total scan takes less than 40 seconds to produce an easily maneuverable digital full volume CT image. It is becoming the new standard of radiographic care for patients. ILUMA uses the latest generation of advancements in Cone Beam Volumetric Tomography to produce advanced, state-of-the-art images. 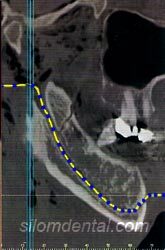 When using ILUMA, clinicians have the most accurate anatomic information to plant treatment procedures. ILUMA delivers accurate images in as little as four minutes with images comparable to Medical CT's with much less radiation doses. 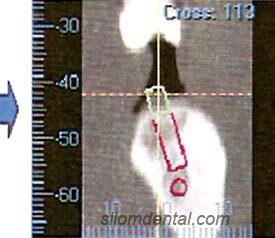 ILUMA V-Implant is used for surgical simulation with dental implants. 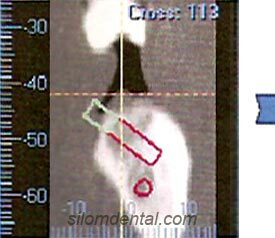 Multi-Sectional Views : ILUMA V-Implant is able to produce 12 cutting planes by rotating every 15 degrees in the middle plane of the created implant. Export to STL : ILUMA V-Implant provides features for export of STL files to 3D printers to allow for modeling and fabrication of surgical guide stints. 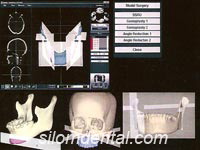 Surgery Simulation : ILUMA V-Works supports predefined surgery presets for mandibular surgery. By selecting one of these presets, the user can easily define, cut and simulate surgery. In cases where there are no matched presets, the clinician can define his own cut plane and cut the object manually. MAKE SURE OF YOUR SMILE. Copyright© 2004 SILOM DENTAL BUILDING. All Rights Reserved.